There's always a lot of discussion about foliage up here in Vermont. Perhaps because it's the icon we hang our hats on, or perhaps because of the "duh" factor--by that I mean it's just so incredibly beautiful around her this time of year--or perhaps because so many people depend on leaf peepers to support their bottom lines, fall foliage defines us. And that causes us to talk. For example, everybody wants to know, "When will the leaves be at their peak color?" The answer, of course, is "When they're at their peak color." Color and timing vary from tree to tree. Around here, that means roughly from about right now, until the middle of next week sometime. And by "around here" I mean the little valley we're in, between Stowe Hollow and Cady Hill. It's that specific. To some people, it's crushing to arrive and not see eye-popping colors everywhere, especially in my back yard. But go around the corner to Moscow, and you'll be blinded. Or take a drive over to Worcester down Route 12 and discover a whole new world. Fortunately, we understand this, and we spend a lot of time patiently directing guests so that they can maximize their experience. Most of the time, they figure it out for themselves. 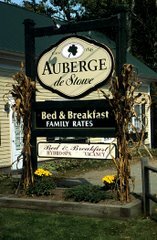 But just for yucks, the folks in Stowe get together each year and decide on a time when peak foliage will occur. It's very democratic: we get together, propose specific times, then vote. I forget what the time is for this year; I'd rather just tell you where to go see the best color.